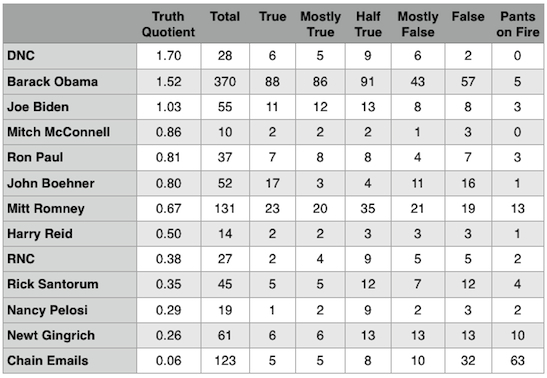 Panderbear hasn't posted the "Truth Quotient (TQ) Ratings - Politicos" table in quite awhile. In part that's because the relative ratings haven't changed much. Truth-tellers and panderers alike have been pretty consistent. Also, with the Republican primary getting all the headlines, the Congressional leadership hasn't been getting much attention from the fact-check websites. A few trends have continued. For example TQ's of both Ron Paul and Mitt Romney have steadily declined over the months. Both began above TQ = 1.0 in truth-telling territory. TQ's for both have since declined well into panderer territory where Congressional leaders have consistently resided. Panderbear has been particularly disappointed in Ron Paul's decline as he had a reputation for being a straight-shooter, even though his targets were often suspect. The good news for some of the politicians in the table is that Panderbear will be dropping them off the list. Panderbear doesn't believe in beating a dead panderer, so the folks who have dropped out of the primary race will be mercifully removed from the next edition of the list. Of course whoever Mitt Romney picks for his VP will be added if he/she has a sufficient number of statement ratings to be statistically meaningful.